There’s something satisfying about circling a fire, whether it’s to toast s’mores on a summer evening or watch cinders soar into the sky. The desire to gather around a fire is as old as time and yet inspires a popular outdoor design trend—the fire pit. According to the American Society of Landscape Architects, fire pits top the list of today’s most in-demand outdoor design elements. During the last few years, Aja Hudson of Earth Designs, a Rosendale-based landscaping collective, has seen a significant uptick in the number of requests for fire pits. Incorporating that element into an outdoor plan takes many forms—from temporary to permanent, from metal to stone, from wood-burning to gas-fired, and from simple to sculptural. One of the simplest ways to create a fire-inspired focal point is to dig a hole and surround it with rocks. Some prefer the natural approach—fitting a fire pit seamlessly into their landscaping—but on a larger scale. 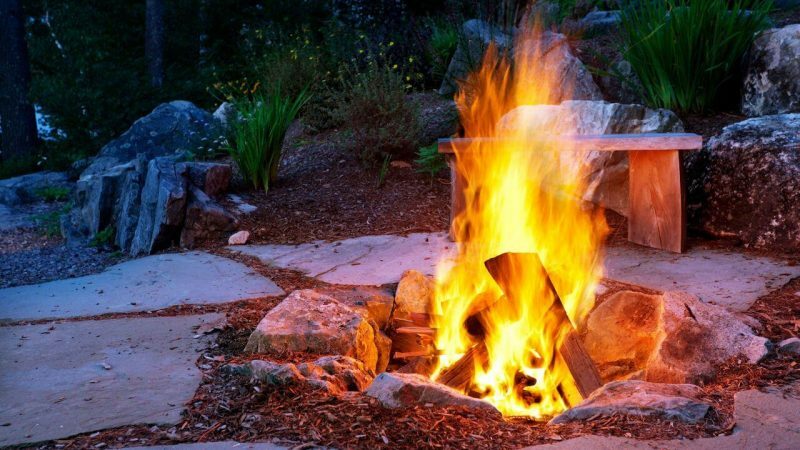 At Earth Designs, fire pits are generally excavated with heavy machinery and lined with boulders for a natural look. Another simple alternative is to purchase a portable unit or kit at a hardware or hearth store. Portable fire pits, or fire tables, made from copper, stainless steel, or cast iron just need to be set up on a fire retardant, stone, or sand surface. With many models on the market, the design can be as simple as a plain bowl or complex enough to qualify as sculpture. According to Jim, the best-selling fire pits on the market use cutting-edge technology to produce a taller, brighter, fuller flame. You can also opt for durable stainless steel screens that are hinged for easy access to the fire and offer protection from flying ambers, as well as inserts to keep smoke from stinging your eyes. A mason or hardscaping company can fit a fire pit into a general paving plan that includes walls, benches, and possibly even a pool or hot tub. Combining fire and water elements is a good way to imbue any landscaping plan with visual drama. Fire pits provide a lovely place to warm up after a swim. The most obvious advantage to a stone, clay, or brick fire pit is permanence. No need to put stone fire pits away during inclement weather and that means they can be used all year. Portable models may need to be covered or taken inside for the winter. “If they are made out of steel they will rust and rot away when you leave them out all winter,” says Tony Mirto of Accord’s A&M Hardware, which sells both gas-powered and wood-burning fire pits. Not only is it essential to keep the fire away from the edge; it should also be kept far from shrubbery. “Keep it away from the trees,” says Mike. “Watch that the flames don’t reach any overhanging branches, especially in spring and fall when everything can burn so easily. And always rake dry leaves and grass away.” Landscaping is not the only safeguard to consider when deciding on a location. Furniture—from benches to recliners—surrounding the fire pit can make it cozier, but if you like to sit close, make sure your seat is not flammable. Alex Kambouris of Accord’s A&G Custom Made Furniture builds beautiful outdoor furniture in cedar and mahogany, including custom garden benches and canopied shelters, but he stresses the importance of keeping wooden furniture at a safe distance. “It’s a good idea to place anything combustible at least 20 feet from the fire pit,” he says. “Some people like to sit closer, but that’s still a comfortable distance to hang out and enjoy a glass of wine.” Alex also suggests checking the regulations in your area regarding the use of fire pits or any existing burn bans. Fire pits run on various fuels. Both wood and gas-fired models offer advantages. Wood-burning fireplaces are easy to install and invite those gathered around to participate in the ritual of feeding the fire. However, starting a wood fire can be time-consuming. You need somewhere to stockpile wood, which can attract insects. This article was originally published in VisitVortex.com. Previous ArticleYoga Disciplines: Which One Is Best For You?